Looking to learn more about Bos grunniens, your friendly neighborhood yak? 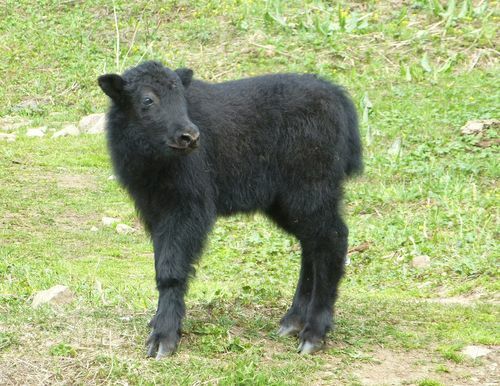 Here is some useful information about yak ranching, slaughtering and yaks in general. How Big Do Yaks Get? 35-40% of the live weight. ?around 24-30 months, and cows at any age after maturity. The price of yak meat is generally about double that of beef, and is comparable to the prices for bison meat. This may vary depending on current market prices, but can provide a rough guideline as to the value of yak meat. - Hide: Up to $1,000, depending on quality, color, etc. - Fiber - $6.00 per oz carded and cleaned, $4.00 per oz uncarded. 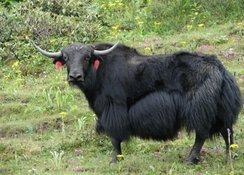 A yak can provide about 1 lb of fiber per year, and the wool is similar to angora and cashmere. Yaks generally subsist on a diet of grass and hay - they are grazers, and can be finished on grass. There is no need to feed them grain, plus they are not particularly fond of it in the first place. Yaks are more efficient grazers than cattle, typically eating half, or even a third, of what a commercial cow eats. This can save you a considerable amount of money on feed when compared to traditional cattle ranching. at 2 - 3 years old. - Black w/ gray nose. Common. - Imperial - pure black with black nose. -Trim mostly black w/ touch of white on forehead, feet, and tail tip. Common. - Royal - mix of white and black, or white and gold. - Golden - golden honey brown. Very rare. You can stock 3-4 yak cows for the same cost as a single bovine cow, and 2 yak bulls for every bull. Yaks are surprisingly friendly animals, and are quieter than cattle. They grunt and snort, and will shake their head as well. Elevation is not an issue with domestic yak - they actually do best at high altitudes and relatively low temperatures.